Serge de Nimes or Denim? Recently we took a day trip to the lovely city of Nimes, Fr (the “i” is really suppose to have a ^ over it but I’m not that accomplished with an iphone keypad). 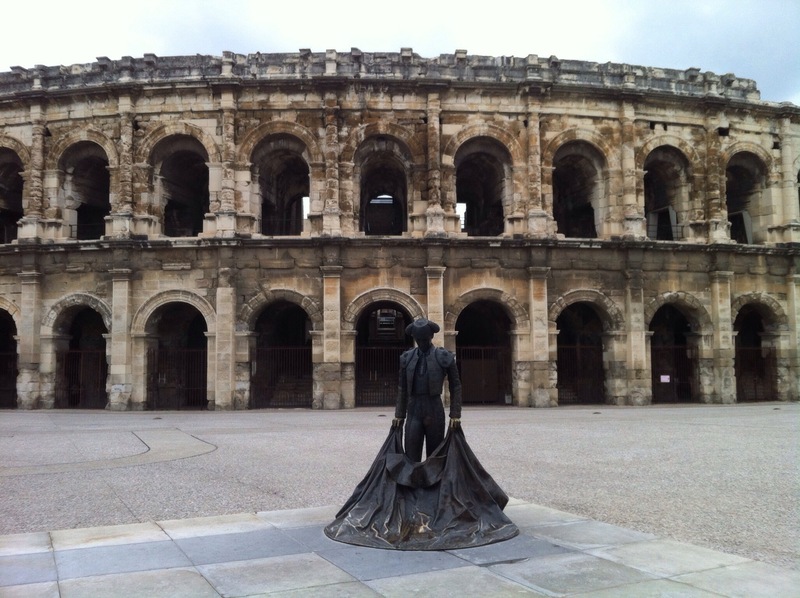 At any rate, Nimes is a huge city with a historic quarter where there’s a massive Roman coliseum from the first century AD. Immediately after this photo was taken it began to pour buckets, so I have no more photos to share but there is some interesting fabric history in this city. Denim fabric got its name from Nimes. 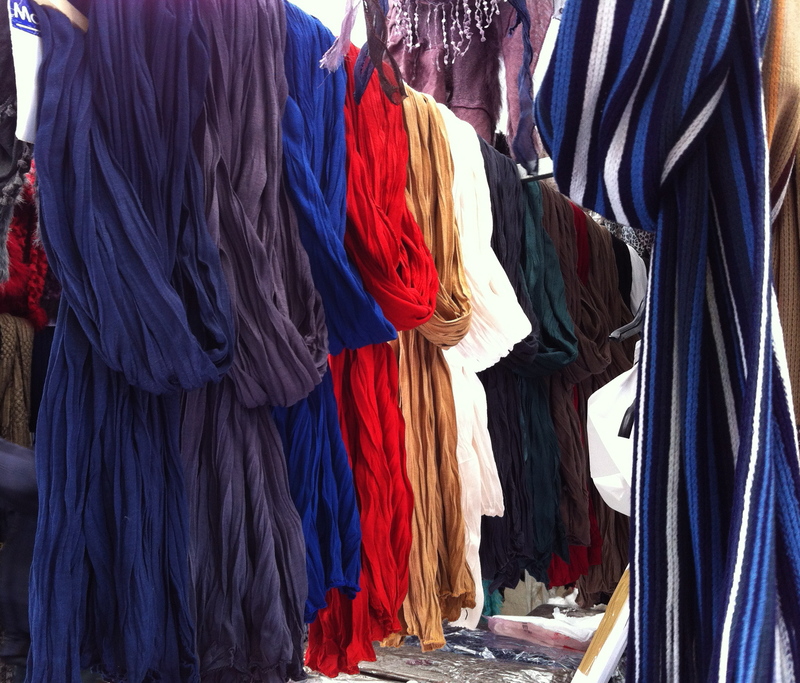 Twill fabric began to be manufactured from wool in the 1600’s, both in Italy and in France. In France and specifically in Nimes, or was called “serge de Nimes”. 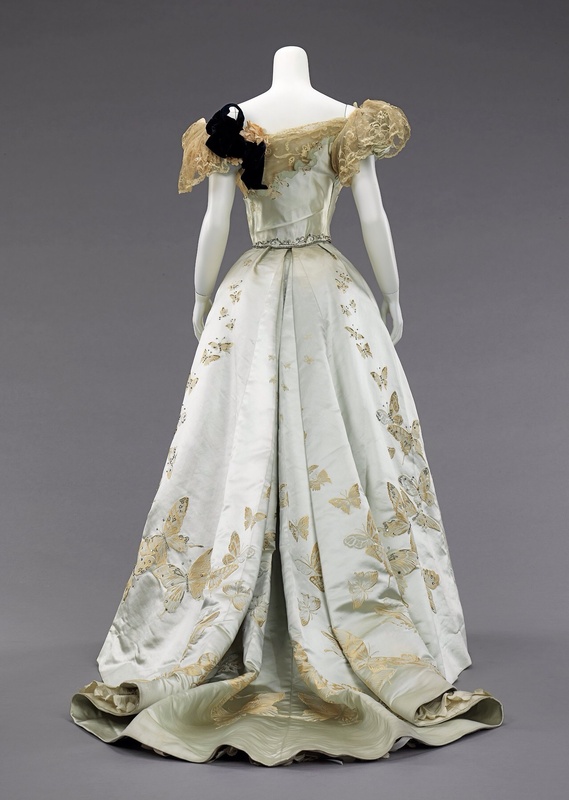 In the 1800’s, the fabric was made from cotton only and continued with the same name, but was shortened to “de Nimes” (pronounced “neem”) or “denim”. In the world of Google Translate, “serge de coton” translates to “twill”, of which one type is denim, the most commonly worn fabric in the western world. 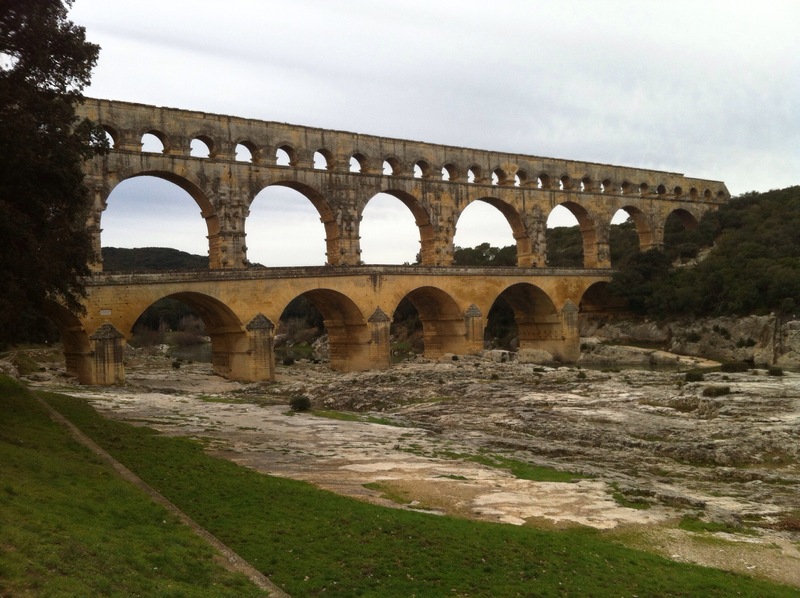 To close out this post I could show you a boring photo of denim, or a photo of the amazing Pont du Gard aqueduct which was also built in about the first century AD, to carry water to Nimes. 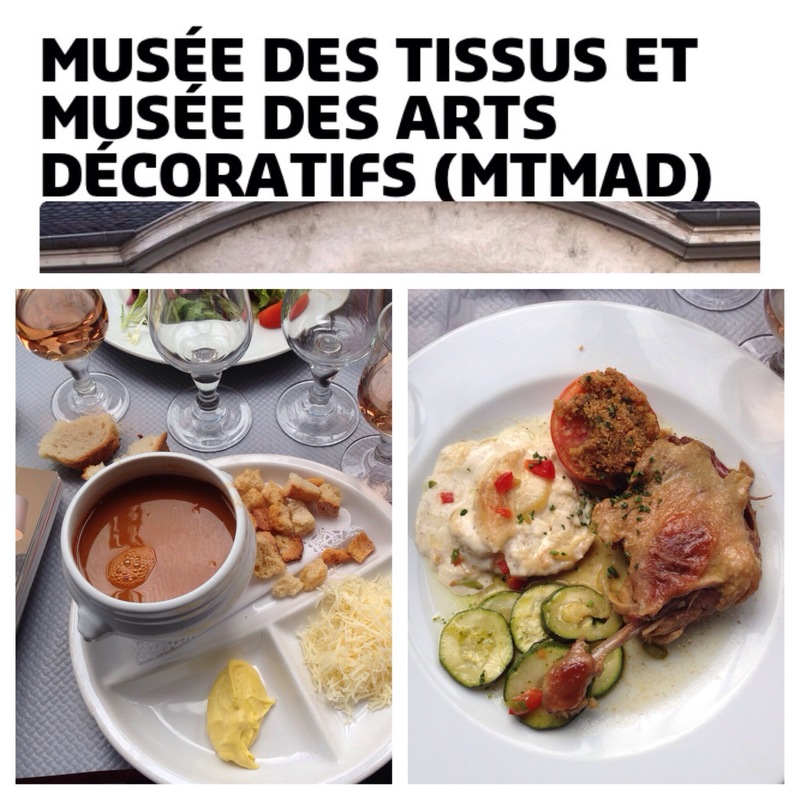 Yesterday we took the train to Lyon, Fr., for the explicit purpose of visiting the Musee des Tissus (Museum of Fabrics) and to have dinner in France’s gastronomic capitol. It was a delightful day. We started with dinner at La Picadilly, a block from Place Bellecour. 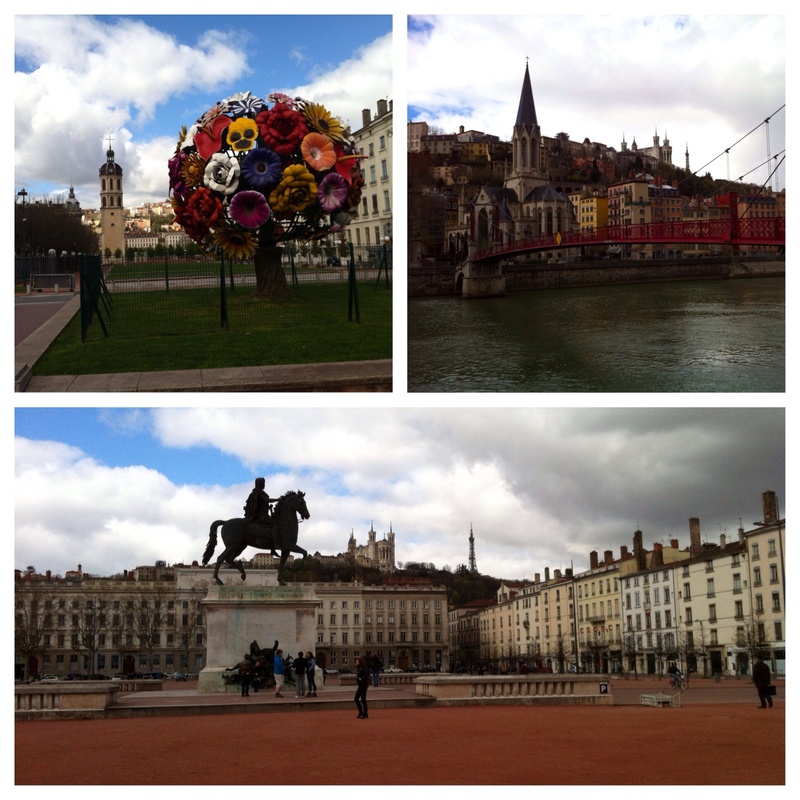 From the 16th – 19th centuries, Lyon was the European center for silk manufacturing. At me time more than 18,000 looms were in use. As the silk industry changed in the 19th century, this museum was created as a way to maintain Lyon’s commercial advantage however eventually the purpose became preservation of the art. Currently the museum owns more than 2.5 million textile specimens covering more than 4000 years. 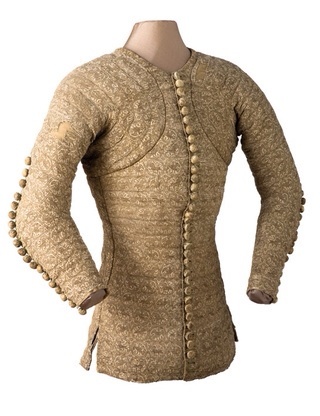 Only a small percentage of the holdings are on display, focusing on the 16th-19th century. On display were gorgeous silk dresses and men’s jackets, silk wallpaper, upholstery and drapery samples and of course religious garments. Here’s the disappointing part – to protect the fabrics, rooms are dark and no photos are allowed. Ugh. In preparation for this post I looked for Internet images and there are few with high resolution. The following are a few photos and a link to items on display. While I visited the museum, Kevin walked through the beautiful “Old City”. We’ve all been in the situation where we have a garment we absolutely love but it’s too small. In the case of a T-shirt, there are few ways for the garment to be enlarged and yet fashionable. 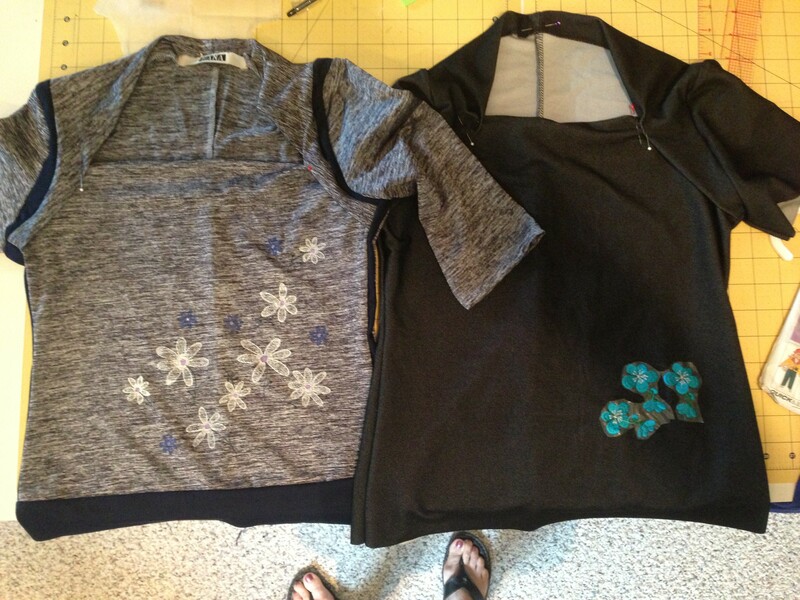 That’s what most of us sewists think, anyway, but for my 11 year old creative GD, she created a way to enlarge a favorite shirt and my job was to make the alterations. Here’s the story. 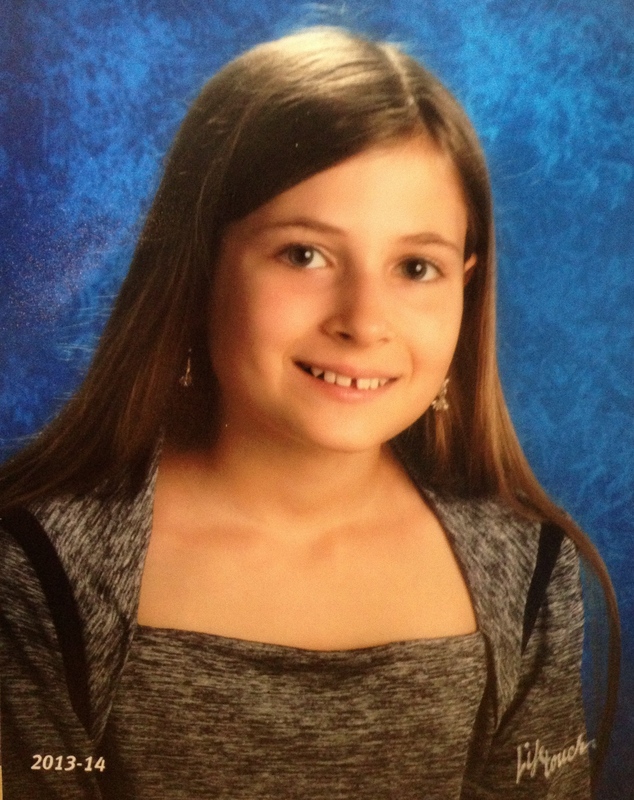 Last summer, Mira and her mother were shopping at a second-hand store when Mira found a shirt she loved. Although when she tried it on, it was barely large enough for her, much less having the required wearing ease and length. Despite the fitting issues (and there was always an opportunity to give it to younger sister Caitlyn), they purchased the shirt for a few dollars. Unfortunately I didn’t have the sense to take a before photo, so bear with me. On separate occasions, Mira’s mother Angela, and Mira told me about the beloved shirt. Angela said she didn’t think I could alter it but maybe I could make a pattern from the shirt. Mira said “Mom doesn’t understand what I mean” and proceeded to describe the alterations she wanted. 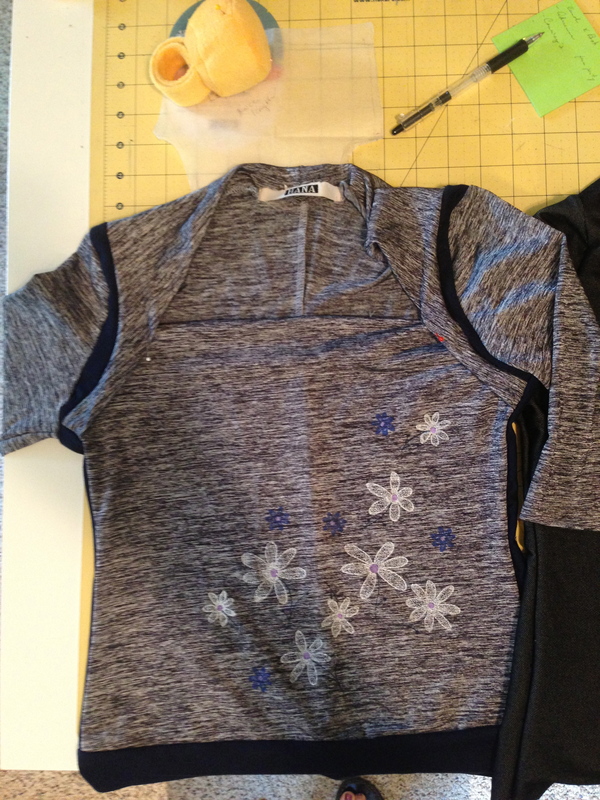 1, Widen the shoulders – cut (lengthwise on the fabric) pieces of navy fabric a little longer than the armscye and 1-1/2″ wide, and then sewed it to each armscye. 2. Add to circumference to the top, cut (lengthwise on the fabric) two pieces of navy fabric the length of the top by 1-1/2″ wide, and sewed it to the front and back side seams, creating a navy stripe down the side of the shirt. 3. Add arm circumference, cut (lengthwise on the fabric) and sewed two pieces of navy fabric 1″ wide and the length of the sleeve underarm seam. As you can see above, this alteration isn’t visible unless the arm is lifted. 4. Shirt length – cut one piece (across the grain) of navy, 2-1/2″ wide by the circumference of the shirt. Sew onto the bottom. I left the bottom unfinished. Once again, here is the result, with a not quite finished shirt I made from the pattern I lifted from the design. In the end, the shoulders were widened, the circumference was increased by 2″ and the length was increased 2″. A real success, though it doesn’t look as great in the photos as when wearing it. What this shows me is that sometimes I need to think outside the box. Now I know that this method could be used to alter other types of t-shirts that are a size (or two) too small. Posted in Alterations, Fabric, Family, Sewing for Children, TutorialsTagged add length to a t-shirt, add width to a t-shirt, how to alter shirt that's too small, modify t-shirt too small, widen shoulders of t-shirt. 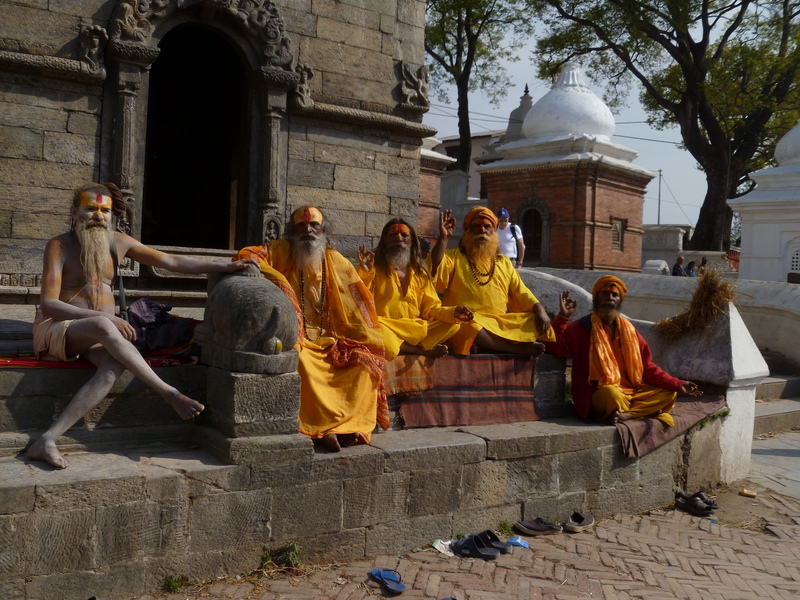 Like India, Nepal’s fashion scene is pretty spectacular. While the clothing is different from your favorite fashionista’s attire, the colors are beautiful and women wear their garments with great pride. 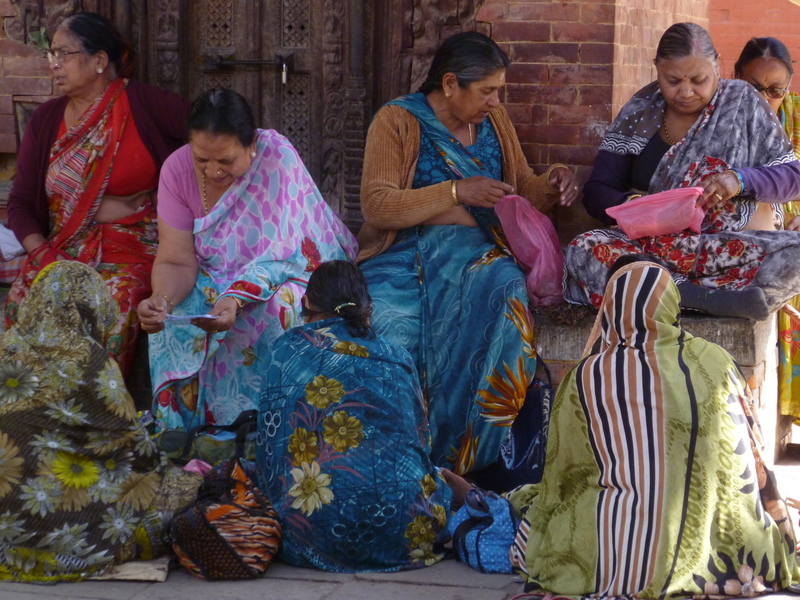 Unfortunately, instead of being manufactured in Nepal, using the traditional block printing methods, many of the fabrics are now imported from China. This causes concern on two fronts: 1)The end of the tradition of block printing and 2)Loss of jobs for persons who work in the textile industry. Our tour guide spoke of two textile plants recently closed leaving 1400 people unemployed. 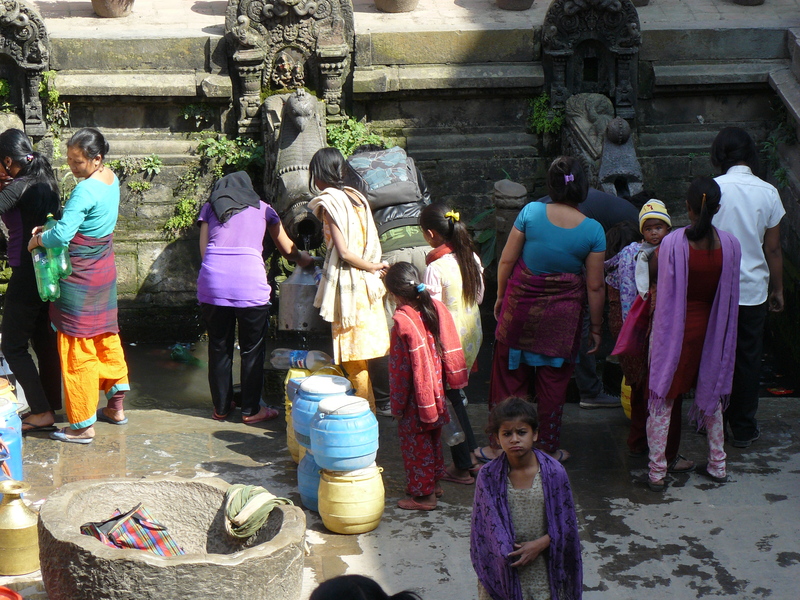 As China produces fabric more inexpensively than Nepal, this will continue to occur. Not to Nepal’s benefit, there are rolling electricity black-outs in most communities which certainly doesn’t benefit this or any other industry. 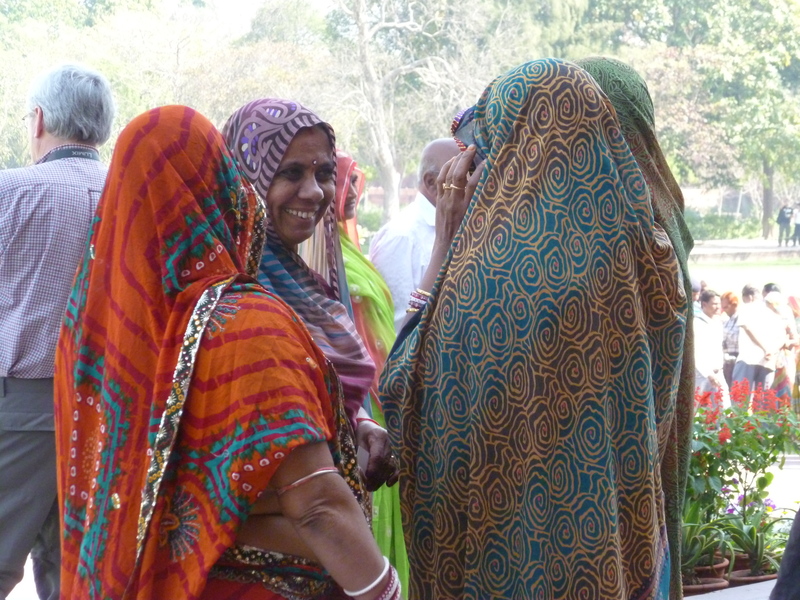 All of the gorgeous fabrics are not cottons as many of the sari’s are also made from polyester. 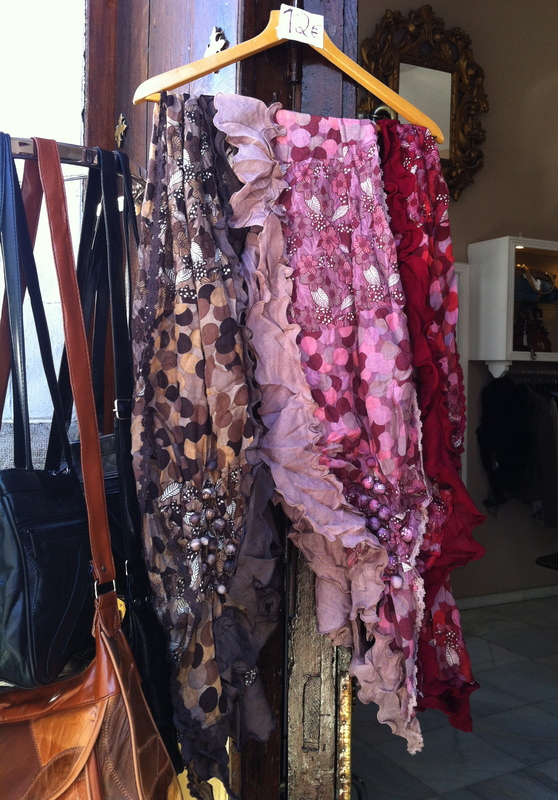 No matter which fabric, the colors are gorgeous. Below are several more photos. 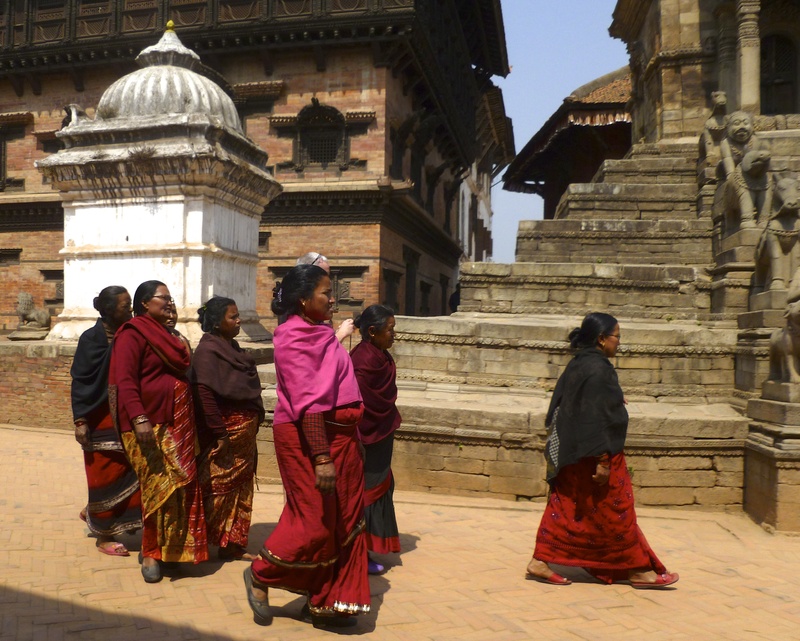 In the past few weeks we had the privilege of traveling in India and Nepal; a countries where we saw thousands of women wearing the gorgeous and elegant “sari”. Surrounded by all of that fabric, it seems impossible that I would have returned home without a single cut of fabric. Even my BIL bought 2 Indian sari’s – essentially 6 yards of fabric, and I’m sure he has never before purchased fabric. What was wrong with me? 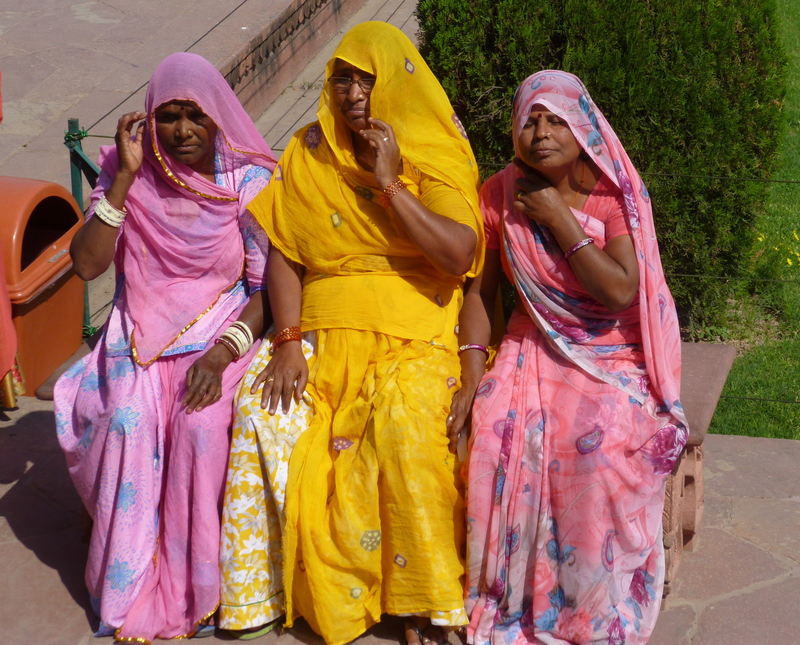 With no purchases to show you, I’ll share some photos of the beautiful women of India wearing stunning garments. They were so easy on the eyes that I couldn’t stop my camera from snapping just one more photo. Enjoy! 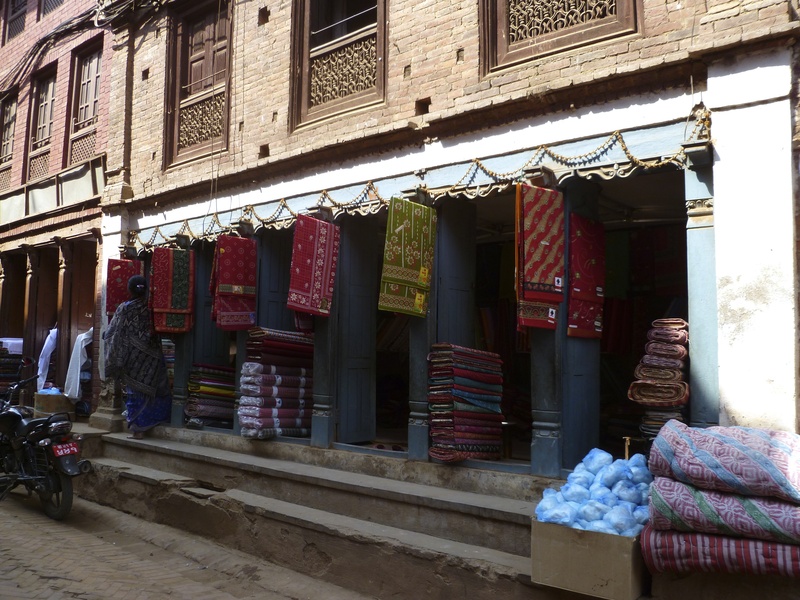 Next time, I’ll discuss Nepal’s textile scene, which is somewhat different than India’s thriving textile industry. Just wanted to update all of you on what’s going on. 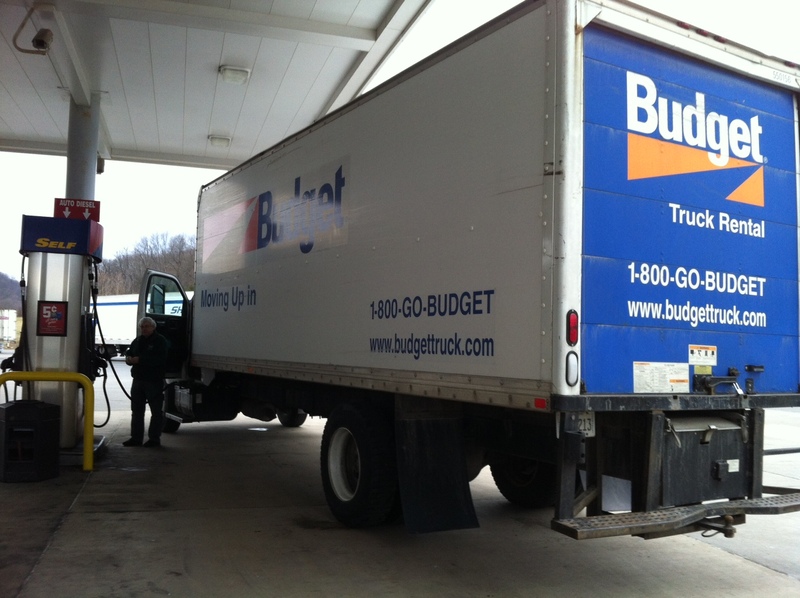 In the past several weeks we packed up our belongings and sold most of our furniture in preparation for moving. Then, a few days ago we closed the sale on our Philadelphia home, had the truck loaded with an embarrassing number of fabric bins and sewing supply boxes (and a few additional household items) and set out for Wisconsin. Once in Wisconsin and immediately before a winter storm came through we had everything moved to a storage unit where our possessions will stay until we find a home. As the movers were unloading, I was able to pull out a few boxes of sewing supplies and place them near the storage unit door. Two of my sewing machines are still in Philly – we’ll fly back next week and will drive our car to the Midwest, including my machines and other items we didn’t want to transport in the truck. Then I can sew again. I’ll keep you up to date as we move through the next phase of our lives. 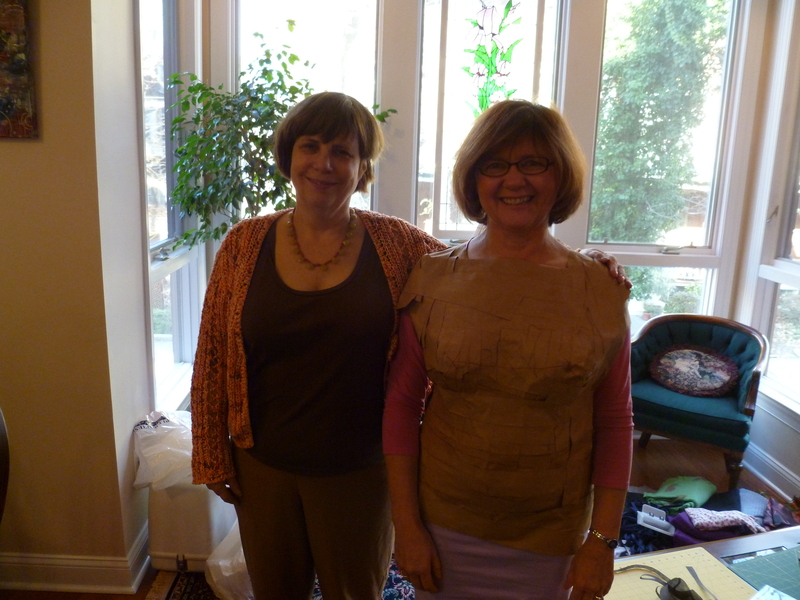 When we planned the day, I thought it would be a cold winter day and we’d all have nothing better to do than to spend a day sewing with friends. 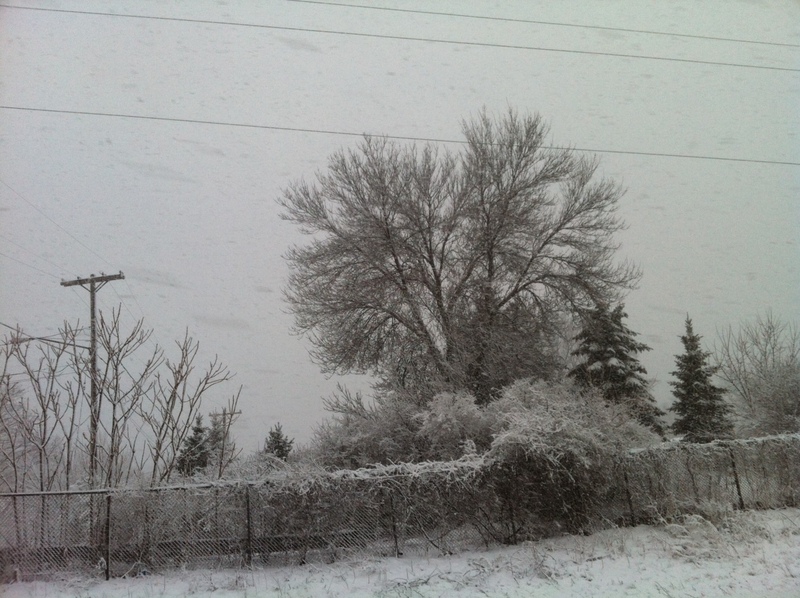 Instead yesterday was 60+ degrees and would have been a great day for outdoor activities. Oh, well. I’ve heard of but never participated in a “Sew In”, so I made it up. Should have googled it but didn’t. 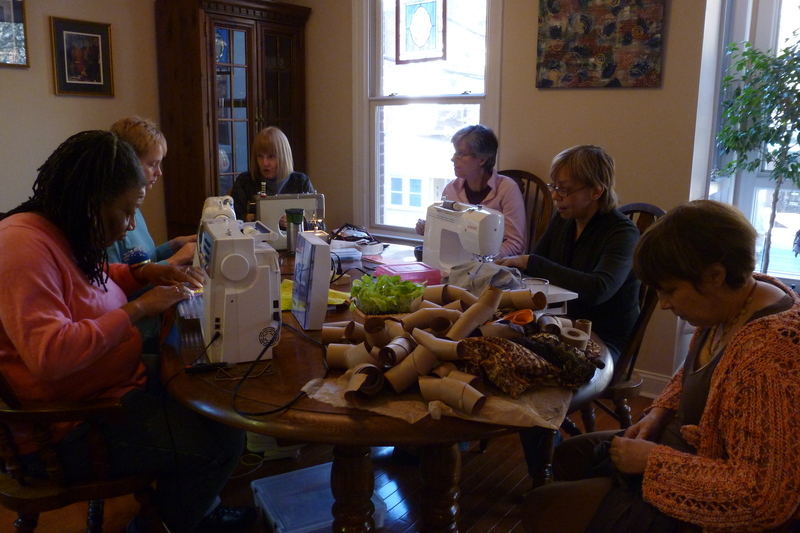 The first step was to invite 9 or 10 Philadelphia sewing colleagues for a day of sewing at my kitchen table. Seven were able to participate, which was just right. 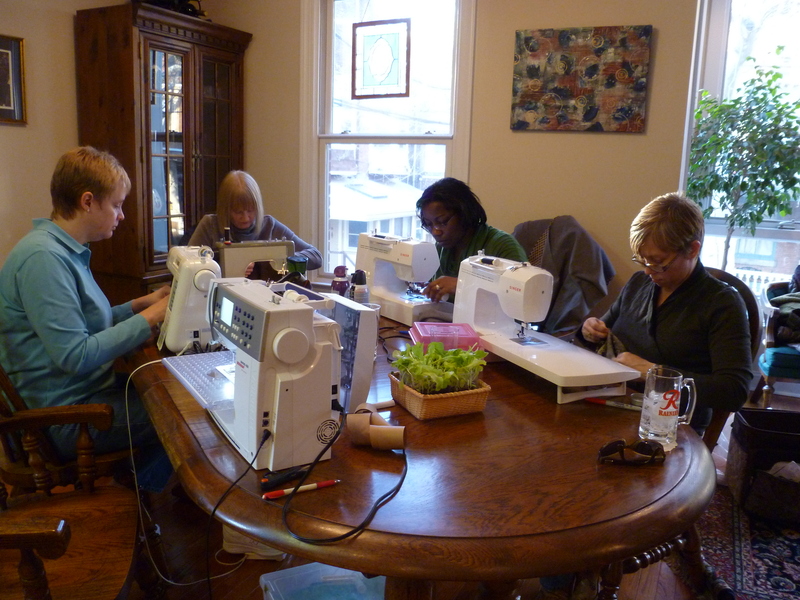 With the leaves in it, the dining room table seemed large until we put six sewing machines on it. While most cut, sewed, clipped, pressed and chatted about sewing, two of us worked on making a paper tape double. All were so busy that we barely stopped to eat lunch or snacks. Val made a fabric vase. I must say, her satin stitching skills are amazing. Noile dutifully and beautifully sewed a corduroy jacket for her husband. Pat joined for fellowship and to get advice on a project. Karen tackled three t-shirts – maybe four. Andrea made great progress on a houndstooth jacket which is going to look terrific on her. Lee constructed a dozen squares for a quilt that will be gifted to one of her sisters. Mimi sewed and brought projects to obtain advice. She and I wrapped each other in paper tape for what will eventually be a fitting double. At the end of the day I was able to squeeze in some time to put together a fur vest for my DD and a matching one for my GD. 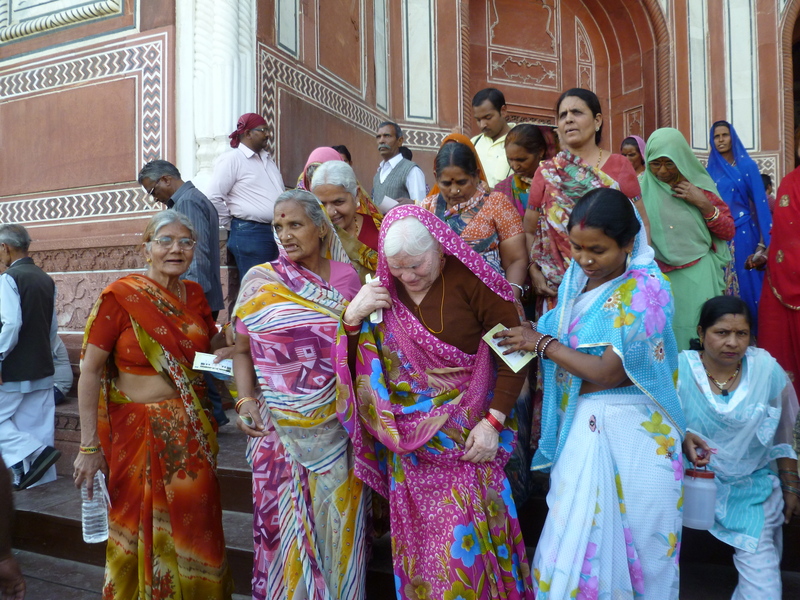 Each person came with machine and bags of supplies in hand but that didn’t stop each of us from bringing stacks of extra fabric, sewing notions, patterns and magazines we no longer needed. The pile was embarrassingly large but one sewist’s trash was another’s treasure. The items were nearly all taken at the end of the day. The day wouldn’t be complete without a tour of the host’s sewing space and stash. 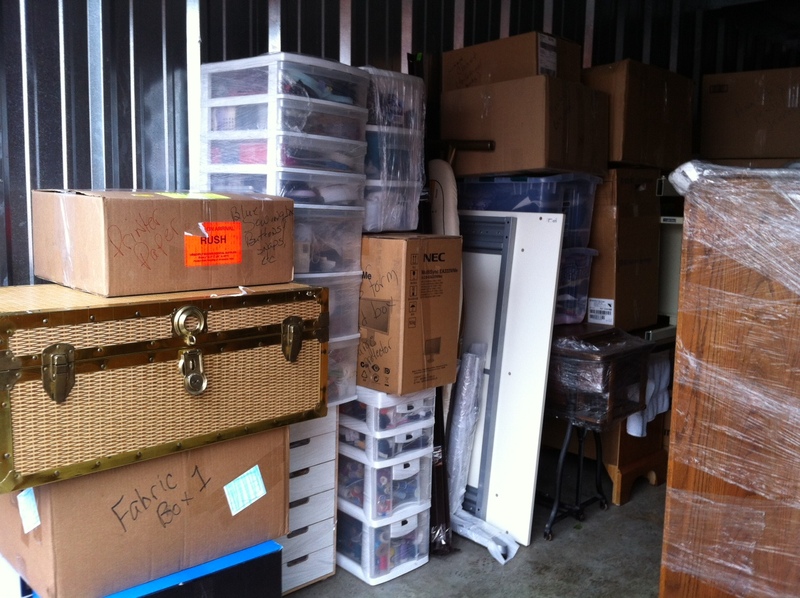 A view of the stash was missing since our home is for sale so most of the yardage is offsite in a storage bin. Wouldn’t want to scare off a prospective buyer with all of those bins of fabric. 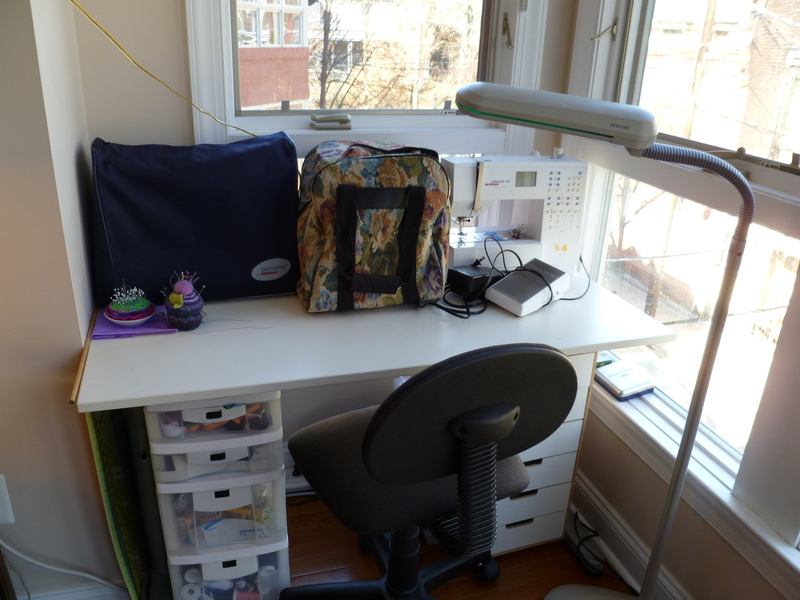 Here’s mine – a corner of our living space but with windows that any sewist would die for. Select a day by putting out feelers with several others who sew. When you have a date, run with it. Invite slightly more sewists than you will be able to accommodate, assuming that some will not be able to participate. For example, my table could handle 6 sewing machines and there was room for more hand-sewers or to make a double. In the invitation, confirm the date, time, location, directions, parking and what you’ll supply. 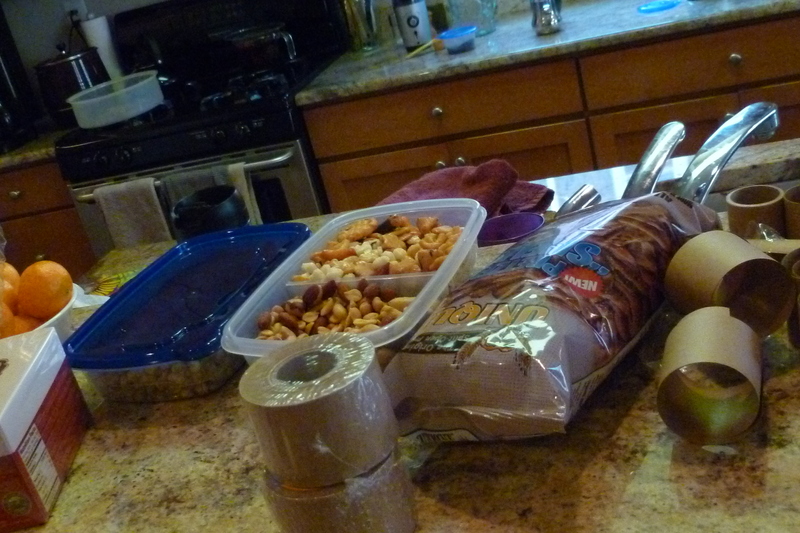 While I love to cook, it made more sense to not worry about food when we were all trying to enjoy a day of sewing. The refrigerator and coffee pot were stocked with drinks, my friends brought snacks and we walked around the corner for lunch. Send a reminder several days ahead of time. Table for sewing. If scratching is an issue, use placemats, towels or a table cloth for under the machines. Place for cutting. Two cutting mats on the coffee table worked well, since our condo’s living room and dining area are adjoined. I’m hoping one of my friends will post about this and I’ll add their links to this post. This was a terrific day (except for the parking tickets – darn). All commented that it was a day of fellowship and fun, and there was more sewing than on most Saturdays. 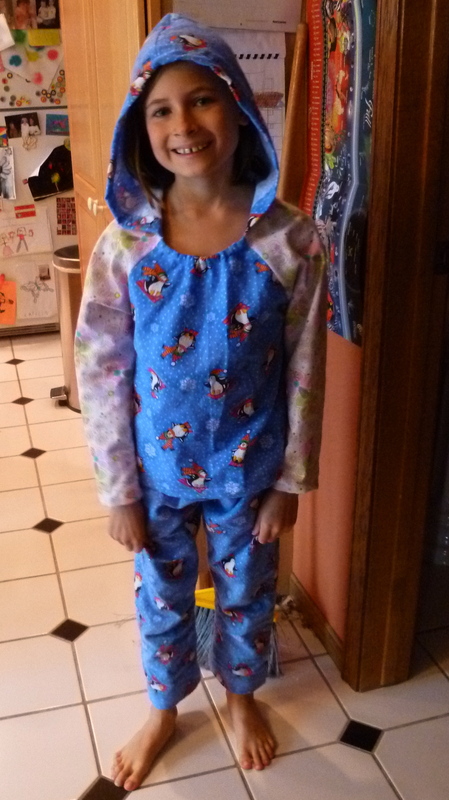 About a year ago, I blogged about teaching Mira to sew her first pair of pajama pants. Unfortunately because we live hours from each other and because visits are filled with other fun activities, we have little time for sewing. However on our last visit we had a “sewing date”. Her choice was to make a pajama top to match the beloved but now “high-water’ pants she made last year. She designed the top, using a complimentary flannel print for the sleeves. Hmmm. So how could I help Mira sew a pj top with no buttons and yet so she could pull it over her head? With not many patterns to chose from, I bought a raglan knit pj top. By cutting it several sizes larger than her size, cutting out the neckline to fit over her head and by placing a small amount of elastic at the neckline we were set to sew. As far as the fabric type, pre-washed flannel is great for a project such as this because the fabric is easy to sew and it doesn’t ravel easily so there’s no overcasting. She passed the test and we were ready to sew. Little did I know that Mira was envisioning a hood on the pj top. So when the sleeve and side seams were done, Mira said, “Now, let’s add a hood”. (Guess I’ve made sewing look way too easy). 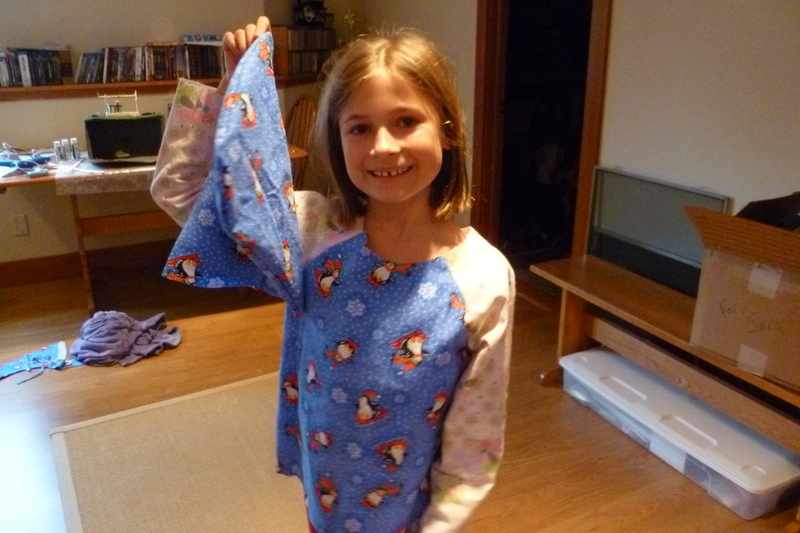 Her bathrobe has a hood, so I traced the pattern and we had a hooded pj top. What a proud girl she was, every step of the way. Sewing (and trying on) time took about one hour. Catie did art projects with her grandpa while eagerly awaiting her turn at the sewing machine. 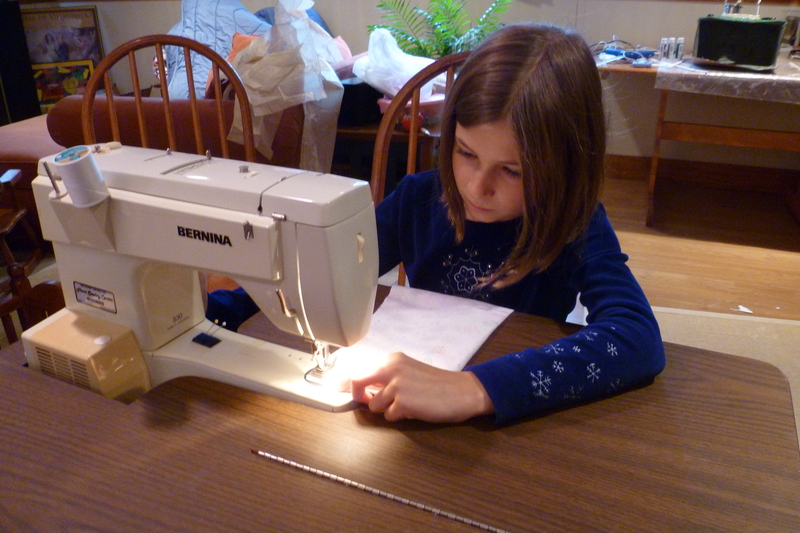 At age 6, she’s not quite ready to sew independently, so we came up with a plan to sew quilt pieces. It worked beautifully. 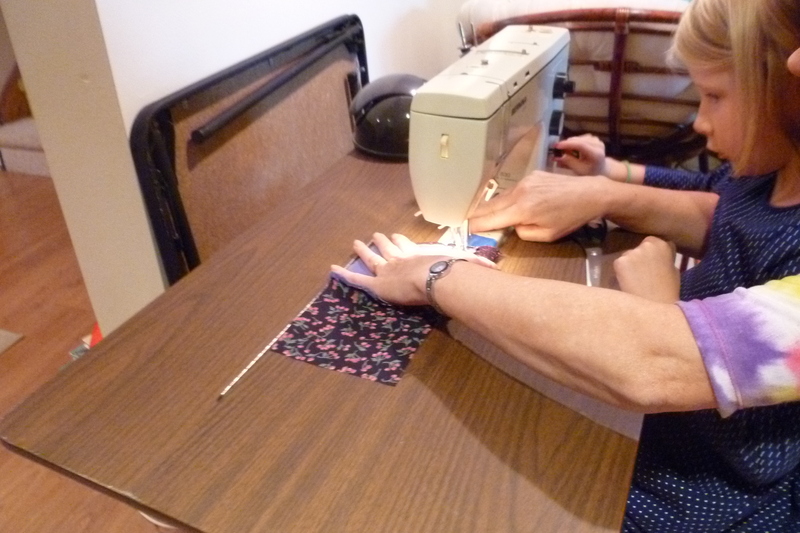 Cate sat on my lap and when needed at the beginning and end of stitching a square, she toggled to reverse the stitch. It was perfect for her – she was involved and still safe. Meanwhile, her foot stayed right on top of mine. What a fun time we had. To be continued…. 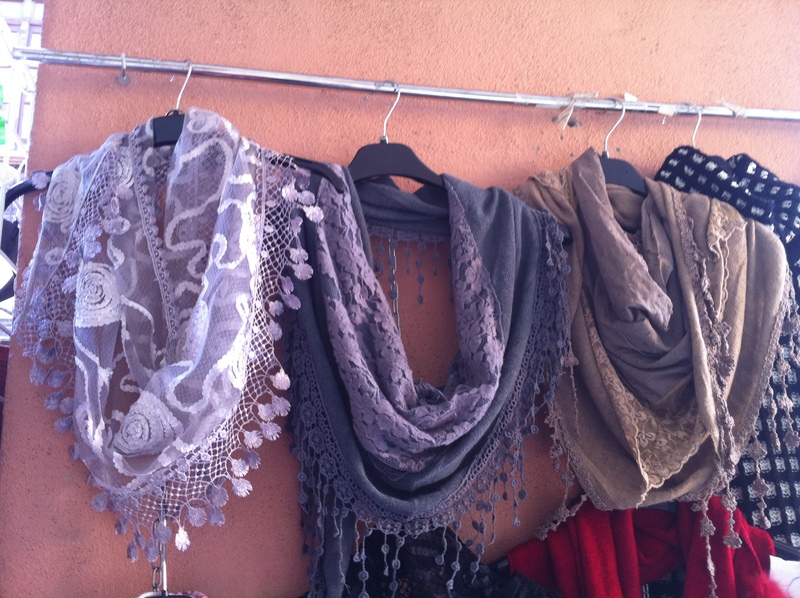 Scarves: A fashion detail that continues to separate European and USA fashion. 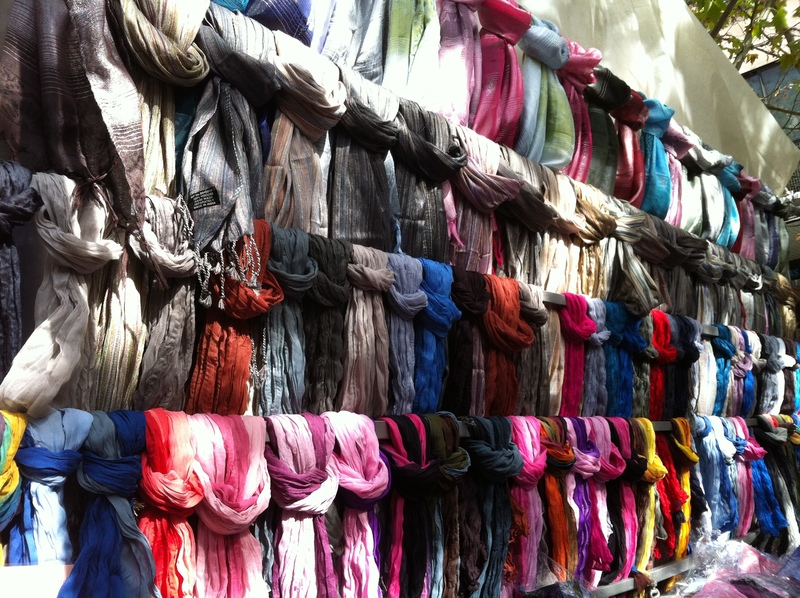 Traveling in Europe reminds me of how much I love scarves. 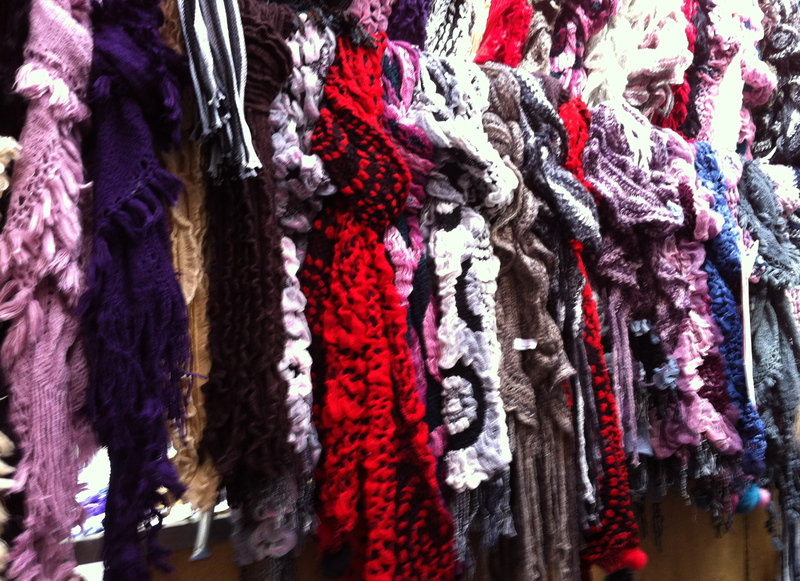 No matter what time of the year, women (and some men) wear scarves for warmth and/or for fashion and with just about any type of attire. 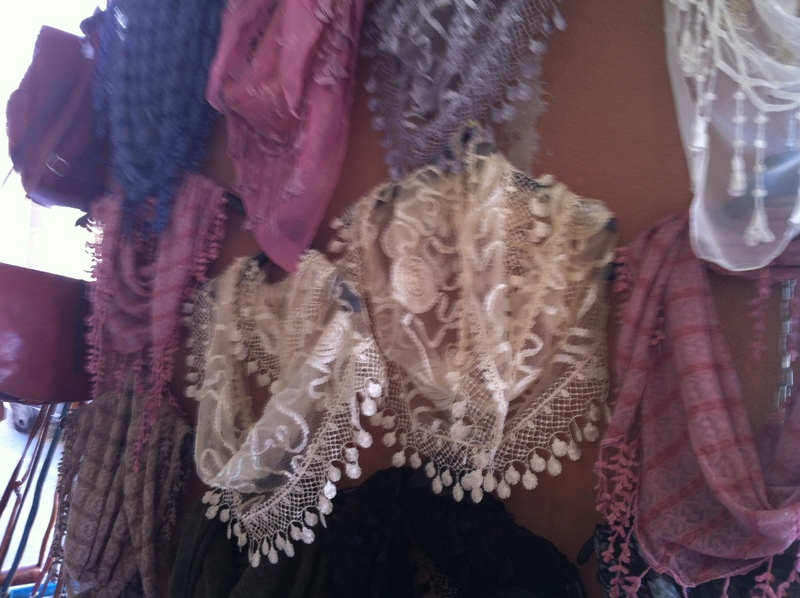 I do wish this fashion trend would take hold in the US – we always have a little bit of the scarf thing going on the in the USA but it’s minor compared to what one sees when walking the streets of a western European country – especially France and Spain. 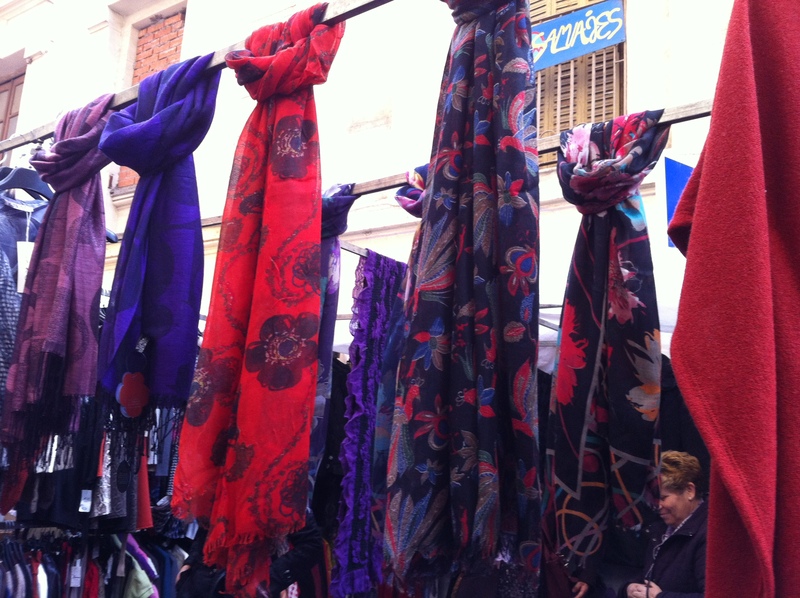 On our recent trip to Spain my travel mates took photos of the many beautiful tourist sites, but I took photos of scarves. Here are a few of the lovelies. 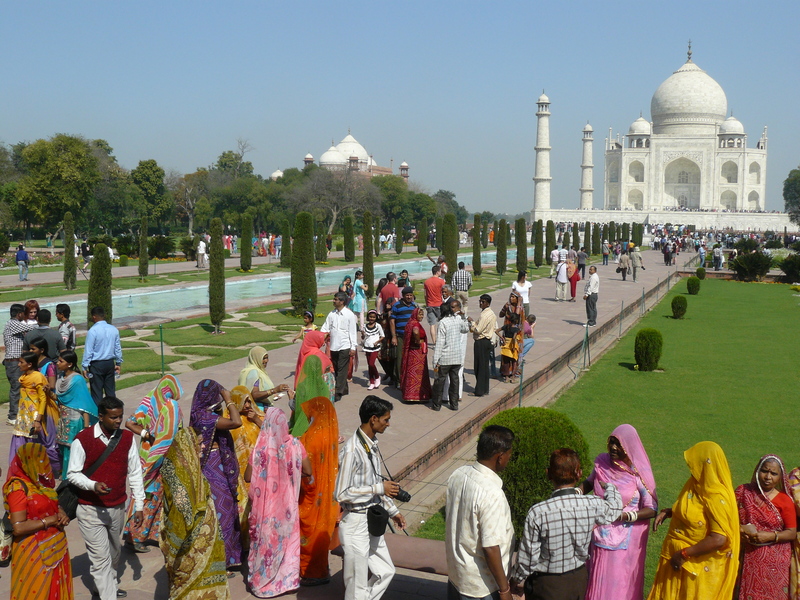 Most are from markets, where prices are often several Euros. Enjoy! Double-click on photos to see more detail. 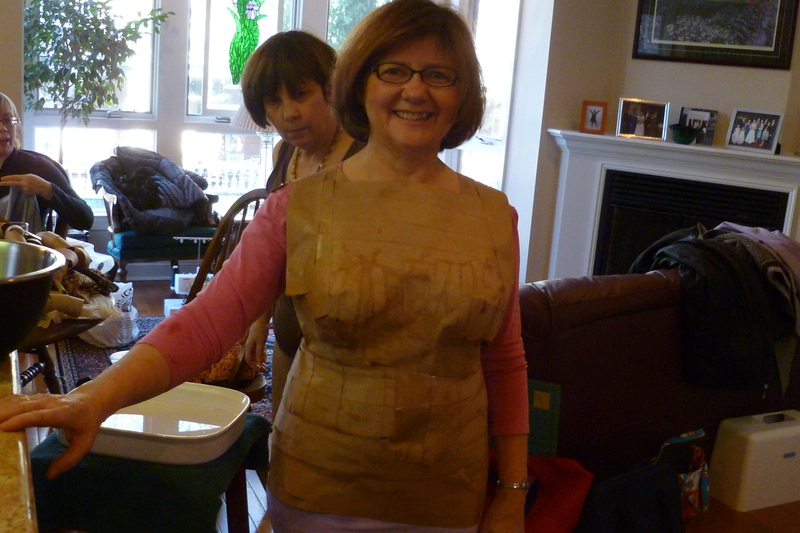 Crinkled fabric is all the rage. Maybe it's time to experiment? Which of these do you think we could sew? In response to the posts on how to sew with pre-ruffled fabric, I’ve gotten questions about which pattern works for sewing a ruffled skirt. The good news is that you don’t need a pattern. This fits into the “it’s so easy that it’s hard” category. 1. 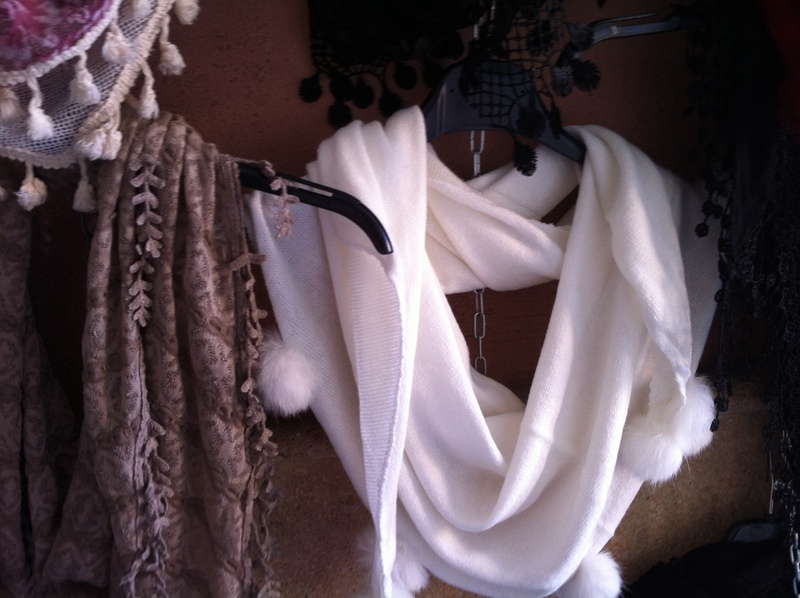 With pre-ruffled knit fabric in hand, cut one piece. Width – equal to the wearer’s hip size (remember this is really stretchy fabric so no ease is needed). Length – slightly longer than desired (it’s easy to cut off an extra ruffle or two after the garment is finished). 2. Position the ruffles at the seamline. Pin in place. 3. Machine baste the seam. You can see the extra pieces of ruffle sticking out. They can be cut off however serging will also do it for you. 4. 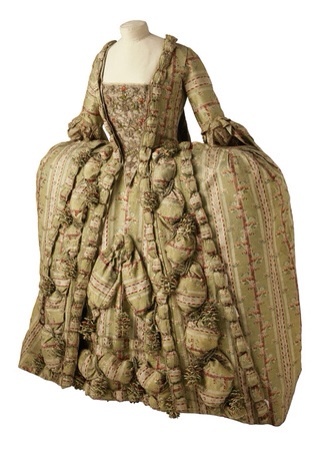 If the ruffles are all in place, you are ready to serge the seam. 5. 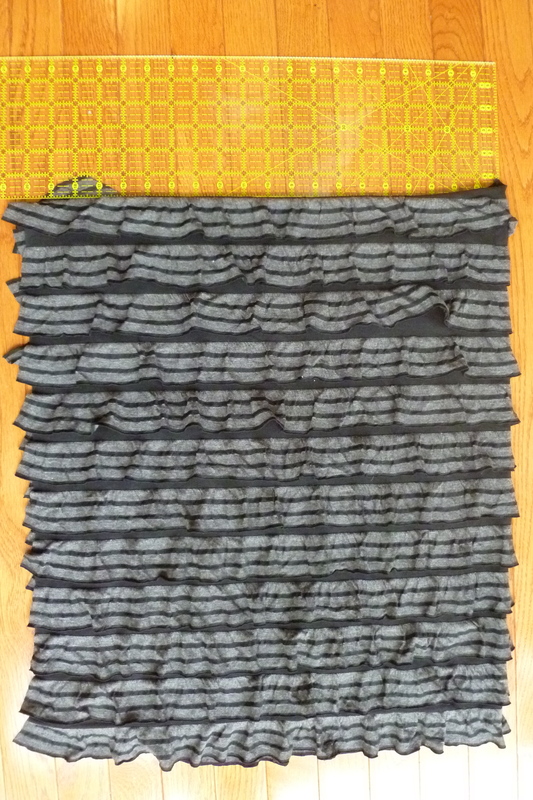 Cut a piece of wide elastic plus 1″ for overlapping the seam. This should be the length of the wearer’s waist or slightly larger if it will be worn below the natural waist. 6. Sew elastic into a circle by overlapping 1/2″. 7. 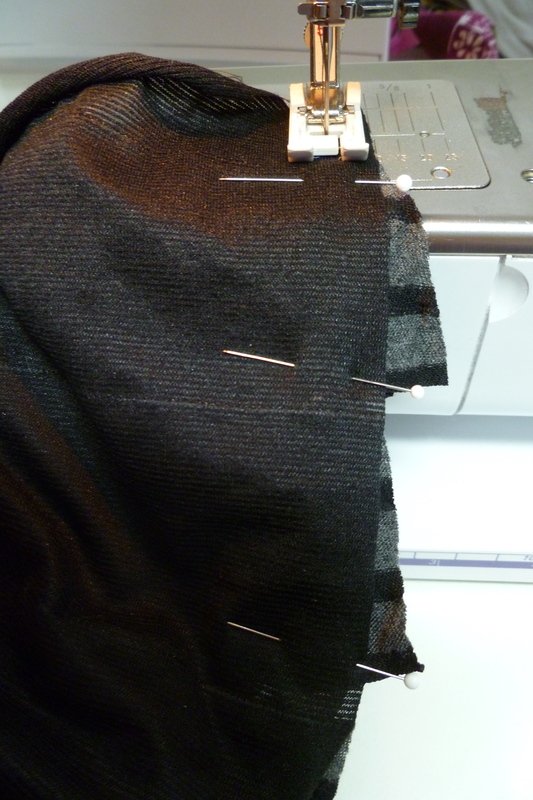 Mark the 4 quarters of the elastic and the corresponding quarters at the top edge of the skirt. 8. 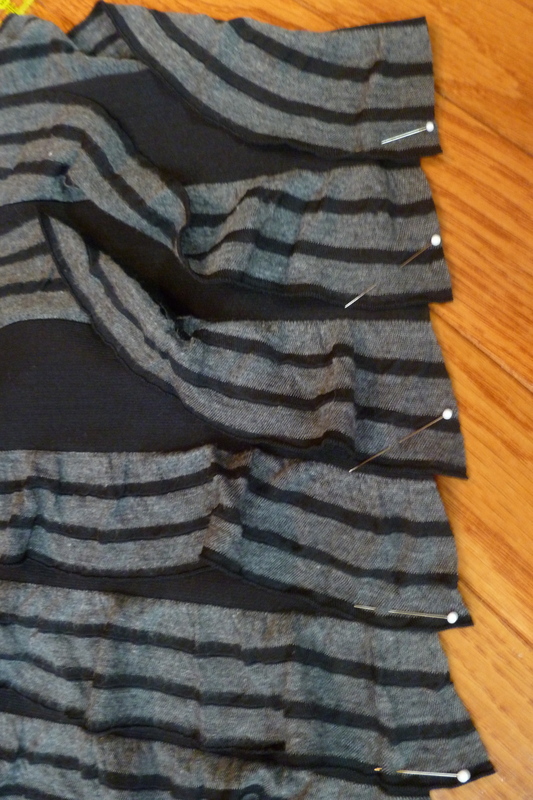 Pin the elastic to the skirt. 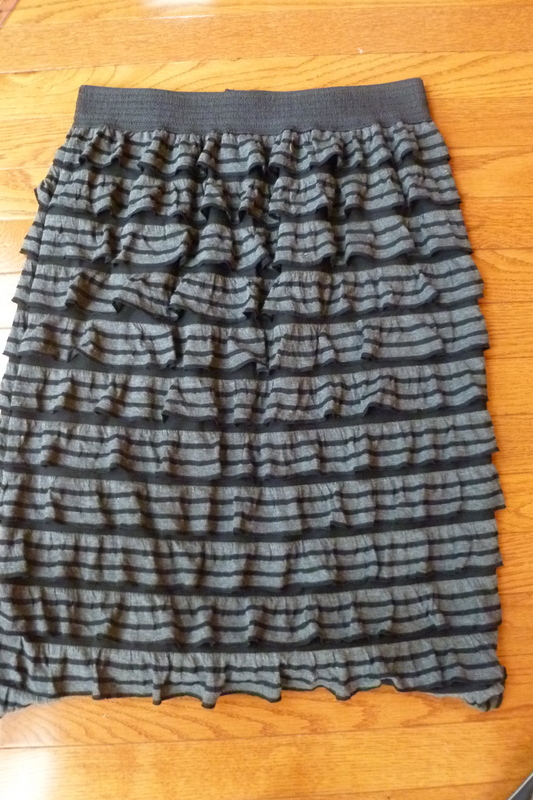 Note: For a clean look, bottom of elastic should meet up with the top of a ruffle. 9. 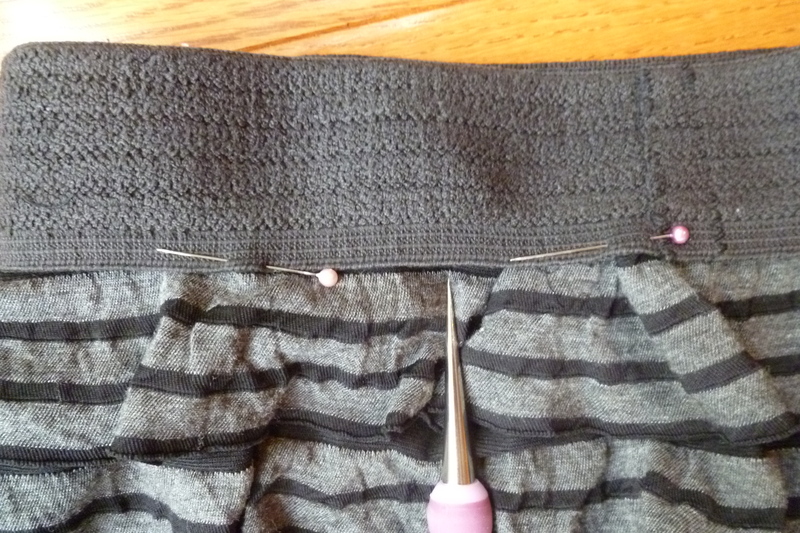 Machine baste the elastic while stretching to fit the skirt. Missing this important step isn’t worth it. It’s really tough to remove stitches as it destroys the fabric edges. 9. 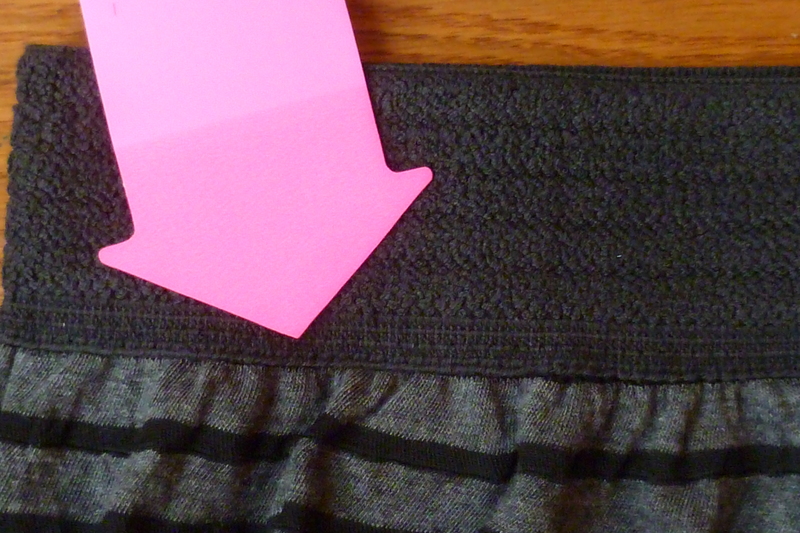 Zig-zag or coverstitch the elastic onto the skirt, stitching very close to the bottom edge of the elastic. 10. If desired, adjust the hem length by cutting off one or more ruffles. You are done. Wasn’t that easy?